Getting married soon?Looking to hire tableware & decor?Let's help you find the right supplier. A magical wedding took place on the 31st of July 2015 at the Four Seasons Hotel in Amman, Jordan. The wedding was designed by the talented brother duo behind XAYA Events, Yaxan and Xaid Chehadeh, who styled the event as French Baroque with a modern twist. The opulence of Louis XIV’s France was updated with a crisp, contemporary color scheme of black, white and grey, yet all the while retained a palpable air of regality. Prior to entering the ballroom, guests were greeted by a tent bedecked in black velvet and chilled-out remixes ofclassicalmusic.Amapofthevast Versailles estate, which covers over eight million square-metres, covered the floor and set the scene. The grand entrance was flanked a pair of monumental, orchid-filled urns, and ushers bedecked in courtly finery of black gowns, sequined masks and ostrich-feather headpieces waited to show guests to their seats within. The ballroom itself was dominated by a magnificent structure running the length of the entire hall, which referenced the iconic Garden Façade at Versailles. Painted in elegant shades of grey and black, it was constructed specially for the wedding. Built into the façade’s centre were three arched openings; each framed an LED screen that displayed atmospheric visuals throughout, from florals to artworks by Piero Fornasetti. These arches also served as the setting for the bride and groom’s grand entrance later in the evening. Click here to see more pictures of this magical wedding! Adjoining the Versailles façade, the designers constructed a raised veranda that, in a clever trompe l’oeil, looked as if it was built onto the façade itself. running along the length of the veranda was a balustrade with more monumental urns – these ones planted with box topiaries that had been sprayed silver for a modern “royal garden” feel. A grand staircase swept down to the dance floor below – which had a black, high-gloss finish to reflect the palace behind and the lights of the sixteen ornate crystal chandeliers that hung overhead. The ballroom’s other walls were draped with a pitch-black cloth that twinkled with hundreds of tiny LED lights. This nod to a balmy, star- filled night sky served as the perfect backdrop and enhanced the impression that guests were revelling al-fresco in regal gardens. Want to see more pictures of this magical wedding? Click here! Seating arrangements came in a number of different shapes and sizes. Taking centre stage were two doughnut-shaped tables crowned with striking three-tier chandeliers. Clear Ghost chairs seated some 40 guests at each. over 1,200 creamy white roses decorated the tabletops, and each place was laid with a metallic, leaf-shaped plate and a crisp black napkin. one of 12 different designs of plate notes sat atop every place, displaying romantic quotes and sentimental sayings as well as a custom monogram of the couple’s initials. These notes reflected the branding that the designers created specially for the wedding, which they describe as a “quirky pop royal theme” and which was designed to add a fun, modern twist. For more pictures of this unique wedding click here! Other seating arrangements were arranged around the outside. square, mirrored tables surrounded by black and clear Chiavari chairs were topped either with four crystal candelabras or delicate white bouquets of phalaenopsis orchids, roses, hydrangeas and peonies. 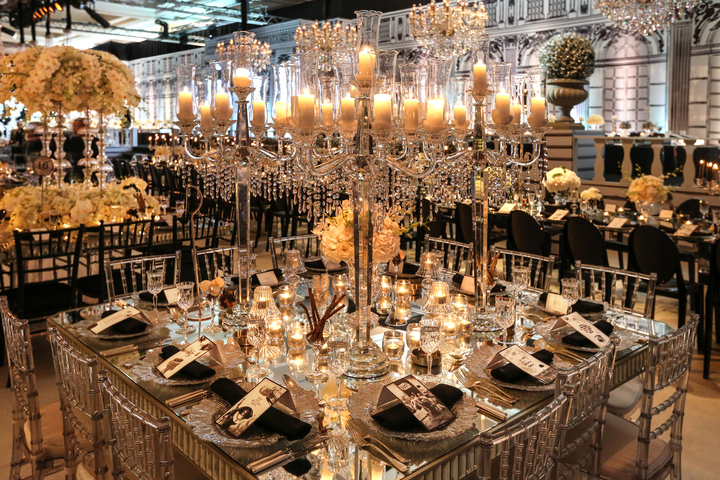 A different set of tables were formed from long glass tops that sat atop mirrored boxes; these were adorned with floral arrangements in crystal vases, silver candelabras and long black candles as well as small black boxes printed with a crown motif – the first kind of take-home gifts for guests. others still held large vases of trailing white wisteria, groupings of baby orchids on silver trays, black Baccarat candelabras and bunches of striking black Ecuadorian roses. For all the flowers, the designers worked with talented florist shatha Jaradat. This magical, time-travelling evening so perfectly captured the atmosphere of a decadent French palace that one could almost imagine Marie Antoinette sweeping down the stairs in all her finery. Yet this was achieved with such a sleek, modern touch that it made for a truly unique event.